Just crossing the street! What's all the fuss about? It looks small in the photo, but this was definitely one of the bigger turtles I’ve seen alive. (Not that I’ve seen nearly enough turtles for my liking… sigh.) She was at least the size of my six-month pregnant belly (if not seven). Sean pulled over and got out of the car as this turtle trudged out into the road. It was on a rural road but not that far out of the city, so there was light traffic. 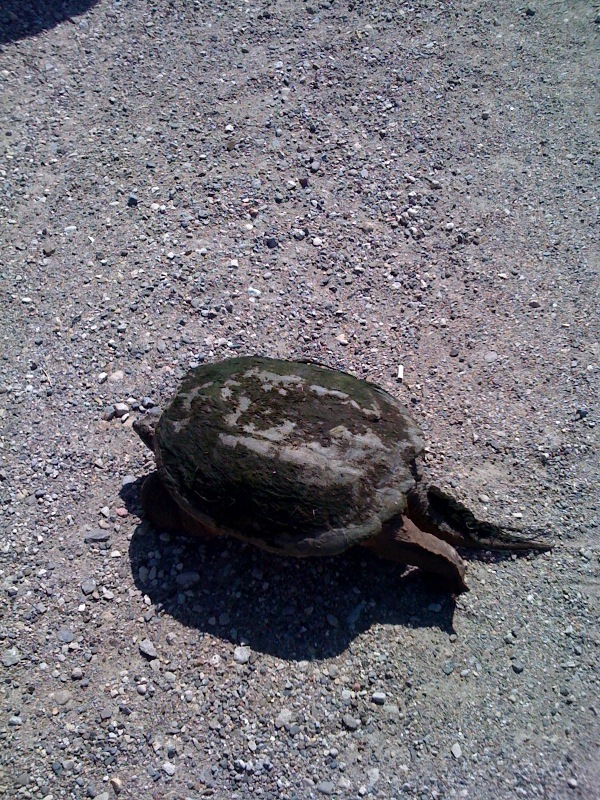 My good hubby stood like a flag to let people know not to run over this animal – though there was one driver who was apparently not paying attention and drove right over it, and it was sheer luck that the turtle was between the tires and was safe. I got out and brought E to see after a couple cars had stopped and people were starting to gather, curious. The turtle (we figure it was a she, crossing to the pond to lay her eggs) had not liked getting almost run over, and was frozen in the middle of things. Sean had lifted her a bit to try to get her going, then quickly let go when she apparently craned her neck around as if to punish him with a chomp. (I’m told she was a snapper.) She also stretched her legs a few times, to rise up and look threatening, I guess. He deals with these turtles regularly, it seems. While he went to get a shovel, a lady in a white capri pantsuit nudged the turtle with her foot until she began to walk again. There was a small crowd of us slowly crossing the road with this majestic reptile, including a young gentleman wearing a very festive purple shirt with an orange tie – and a fedora with an orange band. He was particularly enraptured. Unfortunately, as I say, this photo does not do our Easter Turtle justice. Her back was all mossy, her legs ancient-looking and scaly, her eyes ringed with wrinkles – and they did a funny rolling thing whenever she blinked. Looking at her, you could suddenly envision a direct line to prehistoric times, when this venerable lady had many more scaly compatriots than she does now. It seemed downright rude of this guy to literally shovel our distinguished creature off the road over the fence (to where the pond was), especially since she’d made it to the side of the road by this time. We all cringed, worrying that he was hurting her with his sharp shovel, and winced when she hit the grass with a thunk. But I guess he knew what he was doing. We were the naïve ones, asking each other, “How will she get herself flipped over?” Well folks, the turtle has not survived for millions of years without knowing how to turn itself over. This one waited for a minute, then stretched her legs experimentally and proceeded to put her neck out – that is, stretch until her head touched the ground to lever herself back over. Crazy cool! Relieved, we all went back to our cars and drove merrily away. And that’s the story of the Easter Turtle. ← What to do if you don’t like rain – or if you do!